Today I want to talk to you about the change management decision loop, or agile decision making. Now, at some point during change management you will grow tired of talking about and celebrating change, but do not let up. Change is transformational. It’s transformation, not a transaction. It’s a process, not an event. So, keep turning over every rock until there’s no longer a trace of the status quo. John Boyd was a World War II military strategist. Picture here planes in a dogfight. What he said is that during that dogfight, each pilot went through these four phases of decision making – observe, orient, decide, act – over and over again. And whoever did that the fastest is the one that won out. This will help us assess our change. So, let’s take a look. Observe. What is going on around us? What’s the situation? Orient. What do we need to orient to, or adapt to, to figure out what’s going on and how we need to change in light of that current reality? Decide. We decide what to do. What have we identified? What opportunity or need is there for change? What can we decide on that will actually move us forward? Act. How can you see this through to make sure it’s completed? What will you do to observe then the results? This loop is never truly ending. One decision leads to another, so it’s always continual. You must evaluate the decisions and improve your systems over and over again. And the quicker you do that, the quicker you will make solid decisions that will lead you to better change and lead you to implementation as you become a better leader and change agent. 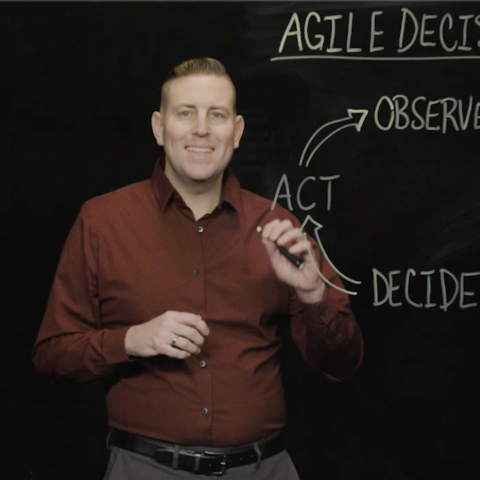 Now that you understand the agile decision making loop, what are you going to do about it?